For dinner tonight we had our first green beans from the garden. Instead of the classic Kentucky Wonder or Blue Lake snap beans, I planted a filet variety, Maxibel. I am not sure if the taste was as great as they said. However, since these beans are a lot thinner than the other kinds, I suspect that the timing given for steaming them was too much and they were overcooked as a result. If I had paid attention to all the details in the seed catalog description I should not have been surprised at how big the bean plants got -- the description does say the plants are tall. There had been a two foot wide path between the raised beds. And four feet between the beds and the fence. However in the last week the paths have begun to disappear under the vegetation. Everything seems to be a lot taller than I was expecting it to grow -- and I don't mean the extra almost a foot that the raised beds provides. I don't know what I was thinking. I guess I wasn't very optimistic about how well the garden would grow. For a while, that seemed like the correct view. However, in the last couple weeks a critical mass situation must have arisen with the vegetation being sufficient so that the plants started blooming and putting out a lot more growth as well. The pumpkins are taking over one corner of the garden area. And the tomatoes have claimed the opposite corner. The stakes I used for the tomatoes were overwhelmed by the plants and disappeared in the foliage. A few days ago I noticed that the tomatoes were starting to lean over to one side -- they were bending the stakes or pulling them out of the ground. I added more stakes by one set of problem plants and ran string around the whole thing to hold it in place. No sooner than that was done then I realized another group was tilting. By time I went out the next morning, two tomato plants were laying on the savory and basil while a third when across the path to rest on the cornstalks. The seed catalogs list these varieties as "indeterminate" -- thus no maximum height given. The slightly less than a foot depth of the raised beds was not enough to anchor the stakes for the now heavy plants. Even if there wasn't the hardware cloth gopher barrier below, I suspect I still would have had problems with the staking. Now that I saw what happened, I have a sense of deja-vu. My first garden in Saratoga used stakes instead of cages for the tomatoes. I switched to wire cages and things were so much better in later years. It is too late for wire cages this year. For now, 6 foot T-posts just outside the beds next to the groups of tomatoes will have to do. Between them there are four or five rows of jute string with the tomatoes captured in the middle. There were some crunching noises coming from the plants as I tried to get them upright. Time will tell if it the plants are completely broken or just badly battered. Next year I will have wire cages for the tomatoes and also as a trellis for the peas. You can see more of my(garden) at http://gallery.vistagrande.com/album.aspx?aid=121&page=2. The carrot seed I planted did not germinate particularly well. The rainbow carrots from Park Seed (did better than the traditional type I planted. So I just had to pull one out and see how it was doing. It did not want to come out of the ground easily. Perhaps I packed the soil when I filled the raised beds a bit too much for getting nice carrots. The roots were a little crooked but there was no branching. While it was still a bit on the slender side, the carrot was long. When I measured the underground part, it was longer than the twelve inch ruler. No wonder it was hard to pull. The roots are working their way beyond the 1/2 inch hardware cloth gopher barrier attached to the bottom of the raised beds -- they are only 11 inches deep. Well, not exactly a can of worms. More like worms under the (black plastic nursery) cans. Last week I decided that it was time to move the plants in nursery cans to weed around the fence. Much to my surprise, when I moved the large cans containing the citrus trees, I found evidence that there were earthworms at work. In all the years we have lived here, I have only seen a few worms. They seemed like such a rarity here that the last time it rained enough to flood the front walk area, I stopped and moved the one earthworm I found swimming in the puddle back to the dirt. The fact that I found maybe half a dozen or so worms under about the same number of pots, gives me hope that the land will come to life more rapidly than I was expecting as we start to planting the future orchard and vineyard. I had a previous experience with rather "dead" soil years ago when we purchased our home in Saratoga. There was a metal shed and some areas of concrete in the back yard which we removed. I recall that one area was so bad that not even the weeds would grow in that spot for a few years. I was afraid that we might have a similar situation here. Perhaps all that is needed is a little bit of encouragement and some water. While taking photos of the various flowers in the veggie garden, I stopped at the bok choi to snap a couple pictures of its flowers even though those are a sign of a harvest missed rather than future harvest. Instead of pulling out the plants and sowing seeds for a new crop of something else, I let them grow hoping that the flowers might attract bees. Happily that seems to have worked. After I took the first photo, I saw there was a bee working among the bok choi flowers. As it turns out, the bok choi flowers are very similar in appearance to those on the weeds down the hill where I saw the bees previously. I watched this one as it visited a few flowers and took a few more pictures. Before I left, a second bee appeared. Hopefully, they will let their sisters know about the garden and I won't have to hand pollinate the squash and pumpkins. This past week lots more blooms were appearing in the garden. Pumpkins and acorn squash started blooming. Since these are like the zucchini in that they have separate male and female flowers, it remains to be seen how difficult it will be to get them to set fruit. The vines and bushes are all growing vigorously at this point, with the pumpkin vines starting to take over the garden paths. The potato patch also has been blooming. Hopefully that is a sign that it is growing lots of nice tubers below ground. I would poke around in the soil to find out, but the access is a bit difficult with peas growing on one side and green beans on the other. And finally, a couple days ago, both of those started flowering as well. When I went out to check on things today, I found a couple pea pods forming and likewise some minature green beans. You can see more of the garden blooming at http://gallery.vistagrande.com/album.aspx?aid=121. I mentioned in an earlier post that I was pollinating the zucchini because of lack of pollenizers and pollinators. The zucchini seems to be opening only one flower a day, so there is a lack of pollen for the the female flowers. And even if there were loads of open flowers, the pollen would not get from one flower to the other unless there were bees visiting the flowers. The lack of bees is a bigger problem than the lack of zucchini flowers since that effects othat plants as well as the zucchini. Thus, I tend to notice any bees that are around now. 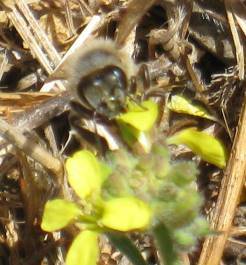 One place I have seen bees is at the bottom of the hill, in some small yellow (weed) flowers. I walked in that area with the camera and decided to take a picture of the only bee I found working a strip which was perhaps fifteen feet wide and eighty feet long. Besides, I should identify the weed and the photo would be useful for that exercise. I went out on the bedroom deck to take some photos of the garden looking down from the second floor. However, before I was out the door I found a more interesting subject. On the deck wall was a tiny lizard. He wasn't completely cooperative about getting his picture taken and ducked over the side. It wasn't the best angle for getting his portrait, but at least he stood still while I took a few more photos. There are a few lizards -- much larger ones -- hanging out around the garden area. I am hoping that they will be effective at keeping insect pests under control. Years ago when we lived in Saratoga there was a large lizard who lived in the garden. At one point he almost ended up at the dump since he was hiding in a pile of debris when cleanup time came. Fortunately my spouse saw him and made sure he was returned home to our backyard garden. I know that particular lizard was doing his part for my veggies. The only tomato hornworm I ever saw there was hanging out of his mouth. We returned from an outing this afternoon and found the king snake next to the front of the house. Hopefully he will continue to hang around and help reduce the gopher population. It only took a couple days after I got the one invading the garden area before new gopher mounds popped up. This week it was behind the kitchen near the valves for the drip system. As usual, I had no luck finding the runway. He had popped up in spots which had been dug up for the irrigation pipes. I wonder if the invasion of mice in our attic last week was field mice fleeing the snake or if the fact that we have not seen any for a few days means that he has been eating well. At least we had our first zucchini make it to the dinner table. It looks like helping mother nature a bit with the pollination has made a difference. Most of the female flowers were just rotting away after the flower faded. A couple almost happened like the one pictured on the right side. Collecting pollen from the male flowers and saving in the fridge for a day or so to use when the female flower opened has gotten us a couple nice zucchinis with perhaps another one or two that will be ready soon. The peas and green beans are still not cooperating. We have harvested enough lettuce leaves for a few salads. Our weather has been pretty cool with the morning fog sticking around a long time. Perhaps the warmer temperatures promised for the coming week will make a difference.